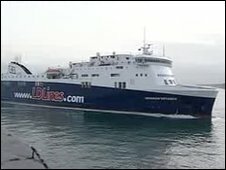 The ferry is being operated by Celtic Link Ferries. Safety inspectors have detained a cross-Channel ferry in Portsmouth moments before it was due to sail. An inspector from the Maritime and Coastguard Agency said the crew of the Norman Voyager failed a basic test of emergency procedures. Passengers who had already boarded the vessel, which was due to sail to Cherbourg in France on Thursday evening, were told to disembark. The ship had been chartered from LD Lines by Celtic Link Ferries. Maritime and Coastguard Agency spokesman Mark Clark said the ship would only resume passenger sailings after a further safety inspection, which would not happen before Friday afternoon at the earliest. A message posted on the Celtic Link Ferries website read: "We will be resuming our service as normal on Friday the 20.11.09 leaving Cherbourg at 22.00hrs with the Norman Voyager. "Apologies for any inconvenience caused."